DIGGING & STORING: Dahlias should be dug in the fall after the `15th of October. Just before digging, cut the stalk off leaving 6” above ground level for a handle. Tie a label onto the handle with the dahlia name. With a spade dig around the entire plant about 1 foot from the stalk. Carefully lift up tuber clump with the spade, use care to prevent broken necks. Set tuber clump aside to dry for a few hours, then remove excess dirt from around the clump of tubers. Next wash excess dirt from around tubers, then divide and label individual tubers. There are many different ways to store your tubers: They may be stored in shavings, peat moss, sand, sawdust , vermiculite etc. We have switched to the newest way of storage which is to wrap them in saran wrap. The tubers do not tend to dry out and stay nice and firm. To store them in this way tear off a sheet of plastic wrap about 2’ long and lay on a flat surface. Place a tuber on one end and roll the plastic over one complete turn. Lay another along side and roll again. Make sure no tuber is touching another; plastic wrap must separate all tubers. You may wrap 5+ tubers per package depending on tuber size, but in the last 6-7 inches fold over the side portions of the plastic wrap and continue to roll to the end. Fasten with masking tape that is labeled with the tuber name. Wrapped bundles should be stored at 40-50 degrees F, but may be stored up to degrees if necessary. We have done this with excellent results. Store in cardboard boxes or other containers you would ordinarily use. Do not store in air tight containers, the tubers will rot as they need an exchange of air. The tubers emerge very firm, low losses due to tuber rot, and no loss from shriveling or drying out. When you are ready to plant or pot up your tubers, open the package, remove the tubers and check for eyes. The tubers tend to eye up earlier with this method, but some will not have eyed up yet as they all seem to have there own timetable. The ones that haven’t eyed up yet can be placed in flats, covered with damp vermiculite or peat moss and placed in 70-75 degrees F. In 1 or 2 weeks recheck the tubers for eye development. 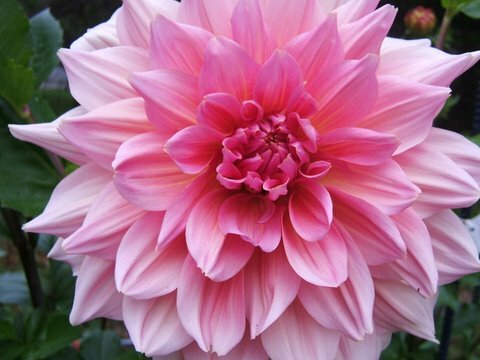 "Guide to Growing and Caring for Dahlias"